HUNTSVILLE, Alabama – Sarah Dilworth Thiemonge has painted for years, dabbling as time permitted. She got serious only after her husband died in 1995 and a good friend convinced her to paint more. Since then, Thiemonge has given away her oil paintings or stacked them in the garage of her Blossomwood home. 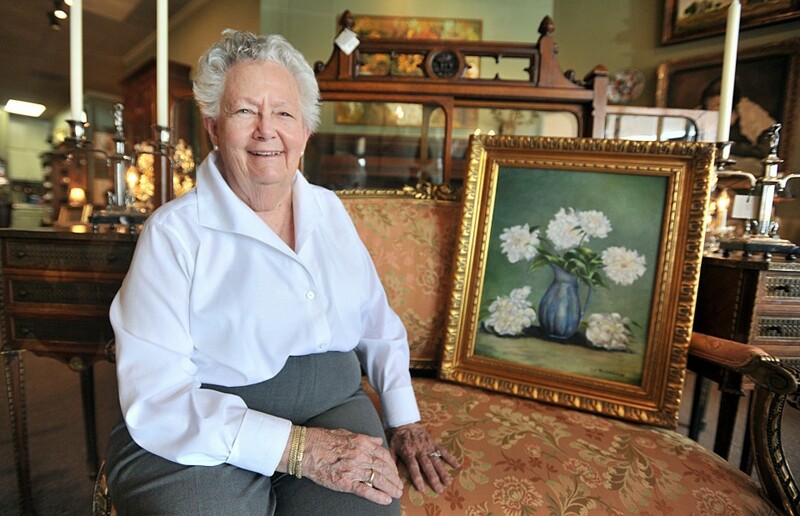 Now, at almost 87, her work is being displayed publicly for the first time with a show at Rivenbark & Roper Antiques. Her paintings, 26 in all, are on view along with works by Huntsville artist Mark Singer. The two will be the featured artists at the store during the 21st annual Huntsville Gallery Tour July 25. Thiemonge had a few informal art lessons as a child, but she is mostly self-taught, she said. She paints in a small space she has carved out in her house and with six friends who meet each Tuesday at Southerland Station. For the most part, Thiemonge paints from photographs she has taken of places she has visited in her travels: a market place in Jerusalem, a flower-covered wall in France. Some of her paintings are inspired by drives through the Madison County countryside and others are more personal. One of her larger still-life paintings is of a pitcher filled with white flowers that were inspired by roses from her mother’s wedding bouquet. Her grandmother rooted one of those roses in 1924, the year Thiemonge’s parents married, and the bush thrives to this day. The pitcher in the painting, “Gangie’s Roses in Babbie’s Pitcher,” was her grandmother’s, she said. Thiemonge’s paintings are remarkable in their detail, said Ken Rivenbark, owner of the store that specializes in high-end antiques and decorative art. He particularly admires how she captures clouds in many of her works, he said. Rivenbark had seen Thiemonge’s paintings and persuaded her to allow him to stage the show. He selected the works on display and had them framed in rich, gold frames, grouping them on the walls of his shop to bring out the details. Seeing the works, which Rivenbark has priced at up to $2,800, hung with such care and elegance was stunning to Thiemonge. Thiemonge and Singer will both be at Rivenbark & Roper Antiques for a reception in their honor during the gallery tour on July 25 from 5 to 9 p.m. The store is located at 900 Bob Wallace Ave., Suites 111 and 112. For more information, call 256-564-9800.